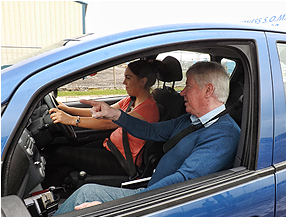 Learn To Drive With Ian Downing at The Furness School Of Motoring, A Driving School in Barrow, Walney, Dalton, Ulverston and Roose. One of the advantages of learning to drive with us is feeling unpressurised. I dont expect my drivers to respond to teaching whatever methods you use, I find that usually new drivers have to get used to the instructor too. I often say to my clients, "Take your time, not mine" That is the answer, I think. Once you have gotten over your nerves and we are doing high fives then we can start thinking about your practical test, it will come quicker than you think! Less than 1% give up driving due to a lack of confidence or nerves, with the other 99% going through to pass their test and are driving around today with the freedom and confidence it gives. Shopping, days out, holidays, driving to work, it really will transform your life! After your Practical Test you may like to find out more about Pass Plus. 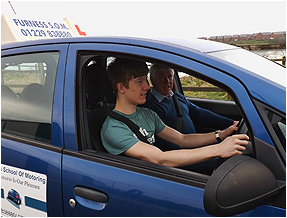 It is a further driving education which will take you to another level. It guarantees that you will be a more confident,competent driver. Call or text for further details. “Id strongly recommend anybody wanting to learn to drive do it through Ian, brilliant instructor. He's taught all of my family to drive and I can say I wouldn't go with another school, if you're on the fence whether or not to startlessons, just go for it!